Shure MCC Cartridge Case DJParts - All Variety of Parts that DJ Needs. 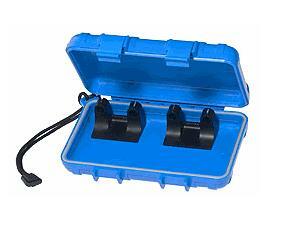 Securely holds 4 cartridges in it's crush proof, water tight structure. For the price you can't beat the protection. The Shure MCC Cartridge Carry Case is compatible with head shells and integrated cartridges featuring a standard lift arm angle, such as a standard Technics or Vestax head shell. The Shure MCC Cartridge Carry Case is not compatible with integrated cartridges featuring an elevated lift arm such as the Ortofon Concorde, the Stanton Trackmaster, or the Numark Phat Track.